The cooking area of Church's Chicken at 210 S. Washington collapsed early Monday evening. 3 employees were critically burned. 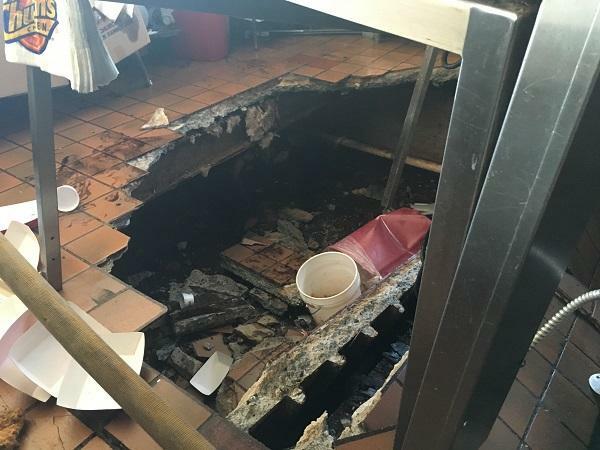 Floor Collapse at Restaurant, 3 Critically Burned, LIVINGSTON, August 1, 2016 - At approximately 6:30 pm on August 1, 2016, a floor collapsed at Church's Chicken (located at 210 South Washington). The area of the collapse was in the cooking area. The odd ground level floor collapse was caused by an apparent chasm underneath the floor. The collapse caused three employees to sustain critical grease burns. According to witnesses, one of the employees fell into the chasm as it collpsed and a customer at the restaurant pulled the female out of the rubble. The three employees with critical burns were flown to Houston. When firemen from Livingston Volunteer Fire Department arrived they immediately summoned emergency medical personnel. Ambulances from Americare Ambulance Service and Texan EMS were dispatched along with Officers from Livingston Police Department and Deputies from the Polk County Sheriff's Office. A small fire ignited during the collapse. Firemen were able to douse the flames quickly. The City of Livingston dispatched a crew from the City Electrical Department to assist. At time of press, the names of the injured employees and other information hasn't yet been released to PolkCountyToday.com. We will update this story when we're able to ascertain more information.